Anaerobic digestion is important for the management of livestock manure with high ammonia level. Although ammonia effects on anaerobic digestion have been comprehensively studied, the molecular mechanism underlying ammonia inhibition still remains elusive. In this study, based on metatranscriptomic analysis, the transcriptional profile of microbial community in anaerobic digestion under low (1500mgL−1) and high NH4+ (5000mgL−1) concentrations, respectively, were revealed. The results showed that high NH4+ concentrations significantly inhibited methane production but facilitated the accumulations of volatile fatty acids. The expression of methanogenic pathway was significantly inhibited by high NH4+ concentration but most of the other pathways were not significantly affected. Furthermore, the expressions of methanogenic genes which encode acetyl-CoA decarbonylase and methyl-coenzyme M reductase were significantly inhibited by high NH4+ concentration. The inhibition of the co-expressions of the genes which encode acetyl-CoA decarbonylase was observed. Some genes involved in the pathways of aminoacyl-tRNA biosynthesis and ribosome were highly expressed under high NH4+ concentration. Consequently, the ammonia inhibition on anaerobic digestion mainly focused on methanogenic process by suppressing the expressions of genes which encode acetyl-CoA decarbonylase and methyl-coenzyme M reductase. This study improved the accuracy and depth of understanding ammonia inhibition on anaerobic digestion. Anaerobic digestion (AD) is a promising technology in the field of waste treatment and renewable energy production. Livestock manure has been processed increasingly by AD to reduce pathogens and to generate bioenergy such as methane.1,2 Thus, the improvement of stability and efficiency of AD is crucial for the comprehensive application of this technology. Ammonia concentration is one of crucial factors regulating AD stability.3 Optimal ammonia concentrations provide sufficient buffer capacity and nutrient for microbial growth, which improves the AD stability and efficiency. However, low or excessive ammonia concentrations usually result in the failure of AD. It is reported that low ammonia concentration (<500mgL−1) decreases methane production, biomass and the aceticlastic methanogenic activity.4 The high ammonia (>4000mgL−1) results in the inhibition of microbial activity and accumulation of volatile fatty acids, which finally causes decreased stability and even failure of AD.3–6 Due to high protein content in manure, there are usually high ammonia concentrations in the AD of manure.3 Thus, AD of livestock manure has to confront the inhibition from high ammonia. It is necessary to reveal the mechanisms underlying ammonia inhibition on the AD process. Although the ammonia toxicity on AD process has been comprehensively revealed mainly based on methanogenic microflora,3,5,12–14 the transcriptional profiles of specific pathways and genes in response to ammonia have rarely been discussed. The AD process consists of AD food web (hydrolysis, acidogenesis, acetogenesis and methanogenesis), so besides methanogenesis, the other three steps of the food web also play important roles in final methane production. Thus, the transcriptional profiles of methanogenesis-related processes are necessary to be revealed based on metatranscriptomic analysis, which can provide a new sight underlying ammonia toxicity on AD process. In this study, based on metatranscriptomic analysis, the transcriptional profiles of microbial community in response to low and high NH4+ concentrations, respectively, were revealed in AD. Specifically, we focused on the expressions of pathways and genes responsible for methane production under different NH4+ concentrations to further reveal the mechanism underlying ammonia toxicity on AD process. The AD experiment of swine manure was conducted with working volume of 2.5L digestion sludge containing 0.75L initial inoculum, and the total solid content was 7% (Supplement Table S1). The high ammonia treatment with NH4+ (5000mgL−1) (HN) and low ammonia treatment with NH4+ (1500mgL−1) (LN) were determined by adding NH4Cl at the beginning of AD, which was mainly based on previous report6 and pre-experiments. All the treatments were conducted in triplicate at 37°C. Seed slurry was prepared by anaerobic digestion of swine manure (obtained from a pig farm in Neijiang, Sichuan Province, China) at 37°C, for one hydraulic retention time (HRT). After methane production reached the first peak (6th day) in the reactor, we performed a semi-continuous feeding mode that 500mL of digestate was exchanged every three days with HRT of 15 days and organic loading rate of 4.5g VS (volatile solid) L−1day−1. The anaerobic digestion was performed for two HRT. The feeding slurry was adjusted to the corresponding NH4+ concentration using NH4Cl. Details about parameters at the start of fermentation were shown in Supplement Table S1. At each feeding, methane content in biogas, volatile fatty acids (VFA), NH4+ and pH were measured to monitor AD dynamic. The methane content in biogas was measured using an Agilent 6890 gas chromatography system (Agilent Technologies, USA), equipped with a thermal conductivity detector and carrier gas of argon. The injection port, column oven, and detector were operated at 100, 70, and 150°C, respectively. The daily volume of biogas was detected by water replacement method. The VFA in the slurry was detected using Agilent 1260 Infinity liquid chromatography (Agilent Technologies, USA), equipped with a differential refraction detector (RID) and mobile phase of H2SO4 (0.005M). Total solid and volatile solid were measured based on previous report.15 NH4+ concentration was quantified with Nessler's reagent colorimetric method.16 At the end of the second HRT, the digestate were sampled in triplicate for total RNA extraction with the RNeasy PowerMicrobiome Kit (Cat. No. 26000-50; MO BIO, USA). The quality of RNA was checked with a NanoDrop 2000 spectrophotometer (Thermo, USA). Ribosomal RNA was removed from the total RNA with the RiboMinusTM kit (Lot. No. 1539791; Invitrogen, USA). The metatranscriptomic (mRNA) sequencing was performed using an Illumina Hiseq 2000 (Illumina Inc., USA). The sequencing raw data from total 6 samples were uploaded to MG-RAST with assigned MG-RAST ID (mgs589946, mgs589949, mgs589952, mgs589955, mgs589958 and mgs589961) for further analysis.17 Prior to the analysis, the quality control pipeline in MG-RAST17 was performed to remove poor quality sequences. The annotation of functional profiles was based on the KEGG Orthologs database including 4 levels. The functional categories was presented as level 2. Level 3 reflected the KEGG pathways, and level 4 (gene expression level) showed expressions of specific genes.18 During annotation analysis, the pipeline parameters were kept at default settings. There were significant differences of AD performances between LN and HN (Fig. 1 and Supplement Table S1). Methane production and content in the biogas were higher in LN than that in HN (p<0.01). The concentrations of acetic acid and propionic acid, and pH were higher in HN. It showed that high NH4+ concentration inhibited methane production and resulted in some accumulations of VFA. The global expressions of genes showed obvious differences between HN and LN (Fig. 2), which well corresponded with the significant differences of performances of AD. Compared with HN, the replicates in LN clustered more closely (Fig. 2), which implied that high NH4+ probably caused more randomness of gene expressions in AD. 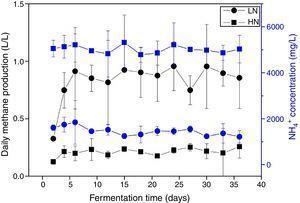 Fermentation performance under high (HN) and low (LN) NH4+ concentrations. All the data are presented as means±standard deviations (n=3). The principal coordinates analysis (PCoA) of global expressions of genes in anaerobic digestions with high NH4+ (HN) and low NH4+ (LN). In the comparison between HN and LN based on pathways (level 2), most expressions of these pathways were higher in HN, but only signal transduction was significantly higher at HN (p<0.05) (Fig. 3). Surprisingly, only energy metabolism was higher in LN (p<0.01). At level 3, most expressions of pathways were not significantly distinguishable between HN and LN (Table 1). The pathway of methane metabolism (ko00680) (usually indicating the methanogenesis in anaerobic digestion) has a higher expression in LN (p<0.01), but the pathways of RNA polymerase (ko03020) and Valine, leucine and isoleucine degradation (ko00280) had higher expressions in HN (p<0.05) (Table 1). The relative abundances of arginine and proline metabolism (ko00330) and methane metabolism showed positive correlations with daily methane production (p<0.05), but those of RNA polymerase and cell cycle-caulobacter (ko04112) showed negative correlations with methane production (p<0.05) (Table 1). Expression profiles of level 2 at high NH4+ (HN) and low NH4+ (LN). ** significant at p<0.01; * Significant at p<0.05. Relative abundances of level 3 pathways under high and low NH4+ concentrations. Taxa with average relative abundance >1% are shown. The p values represent the significance from the comparison of the relative abundances of pathways under high and low NH4+ concentrations. Indicates significant correlations (p<0.05) between the relative abundances of pathways with daily methane production. In redundancy analysis (RDA) of the relationship between the expressions of pathways (level 3) and the environmental variables (Fig. 4a), the expressions of the pathways including methane metabolism, arginine and proline metabolism, pentose phosphate pathway (ko00030), histidine metabolism (ko00340), oxidative phosphorylation (ko00190) and pyruvate metabolism (ko00620) positively correlated with methane production. The expressions of RNA degradation (ko030180), pentose and glucuronate interconversions (ko00040) and Citrate cycle (ko00020) positively correlated with acetic acid and pH. The expressions of DNA replication (ko03030) and peroxisome (ko04146) potentially contributed to propionic acid accumulation. Redundancy analysis (RDA) of key pathway (a) and gene (b) expressions where the methanogenic genes mainly encoding acetyl-CoA decarbonylase and methyl-coenzyme M reductase positively contribute to methane production but are omitted to simplify the figure to be clearer. Besides the overall difference of gene expressions (Fig. 2), the enrichment analysis was applied to further uncover differentiated expressions of individual genes between HN and LN. Probably attributed to significant difference of the expression of methane metabolism (Table 1), most of these genes with significant differentiated expressions (p<0.05) were involved in methane metabolism (Supplementary Table S2). These methanogenic genes mainly encode acetyl-CoA decarbonylase and methyl-coenzyme M reductase. Additionally, most of methanogenic genes showed significant positive correlations with methane production (p<0.05) (Supplementary Table S2). Besides methanogenic genes, two genes involved in the pathway of pyruvate metabolism showed higher expressions in LN, but three and two genes involved in aminoacyl-tRNA biosynthesis (ko00970) and ribosome (ko03010), respectively, showed higher expressions in HN (Supplementary Table S2). 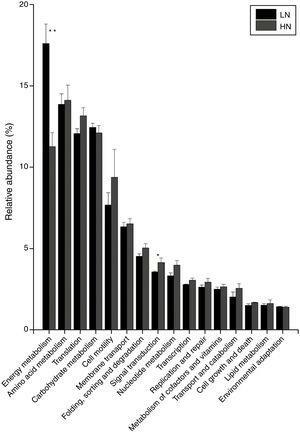 In the RDA of the relationship between gene expressions and environmental variables (Fig. 4b), it indicated that besides the methanogenic genes, the genes which encode glycerol kinase, phosphate acetyltransferase, transporting ATPase and pyruvate_orthophosphate dikinase positively contributed to methane production. The genes which encode ribosomal subunits, tRNA_synthetase and phosphoribosylamine_glycine ligase positively contributed to pH and acetic acid. Although there were 19 genes (each taxon with average relative abundance>0.1%) significantly distinguishingly expressed between LN and HN (Supplementary Table S2), the co-expressions of these genes should be further verified. Based on Spearman’ correlations, the co-expressions of these genes to different NH4+ concentrations were further revealed (Fig. 5 and Supplementary Table S3). The expressions of the genes involved in methane metabolism, glycerolipid metabolism, pyruvate metabolism and oxidative phosphorylation showed a co-inhibition under the high ammonia condition. The expressions of methanogenic genes especially the genes which encode acetyl-CoA decarbonylase were comprehensively co-inhibited by high ammonia. However, the expressions of the genes involved in ribosome, aminoacyl-tRNA biosynthesis, purine metabolism, cell cycle-caulobacter and RNA degradation showed co-enhancement under the high ammonia condition. The expressions of more genes were co-inhibited under the high ammonia condition, which supported ammonia toxicity on AD process. Networks of gene expressions negatively (a) and positively (b) responding to ammonia. The taxa with average relative abundance >0.1% and significant differentiated expressions between LN and HN are shown. Although the hydrolysis of substrates would cause variations of ammonia concentrations during AD, in this study the operations of ammonia addition in HN and LN created distinct ammonia pressures to differentiate AD performances and microbial gene expression (Figs. 1 and 2). High ammonia significantly inhibited AD process by decreasing methane production and content in the biogas, and the accumulations of VFA. The decreased methane content in biogas not only resulted in a low methane production but also indicated a mass of byproducts. The accumulations of VFA, especially acetic acid, implied a potential inhibition of acetoclastic methanogenesis, which agreed well with previous reports.3,5 Although the accumulations of VFA were observed in HN, such accumulations unlikely caused excessive acidification in AD, which was further supported by the pH value (7.8±0.5). Additionally, the ammonia inhibition more probably occurred under thermophilic temperatures than mesophilic condition (37°C).3 Thus, in this study, the inhibition of AD process was supposed to be directly attributed to ammonia toxicity on microbial activities, rather than other environmental factors regulated by ammonia. The microbial activities were obviously regulated by ammonia, which was supported by the PCoA result (Fig. 2). In level 2 pathways, the expressions of energy metabolism and signal transduction were significantly influenced (Fig. 3). The AD actually is an energy metabolism process during which energy is transferred and transformed through various metabolic pathways especially the methanogenic pathways. The energy metabolism mainly including methane metabolism usually couples to actual methane production,1,21 so the inhibited expression of energy metabolism mainly resulted in the low methane production in HN. Signal transduction is usually involved in modulating cell behaviors in response to environmental pressures such as pH and ammonia.22,23 Thus, a higher expression of this pathway in HN could be explained. The obviously higher expression of cell motility in HN coupled to that of signal transduction, which agreed with previous report.24 This further supported microbial response to ammonia by behaviors or movements. Unexpectedly, in HN only the expression of energy metabolism was depressed, but other pathways had higher expressions compared to that in LN (Fig. 3). In consideration of that methanogens are not dominant microorganisms compared to bacteria such as Firmicutes, Bacteroidetes and Proteobacteria in AD,25 it is reasonable to deduce that these pathways except energy metabolism were mainly conducted by bacteria. Thus, the higher expressions of these pathways in HN probably indicated high activities of bacteria under high ammonia condition. This was likely because ammonia could improve nutrient of nitrogen for bacterial growth.4 In level 3, the most significantly differentiated expressions between HN and LN was methane metabolism (p=0.003) which positively correlated with methane production (Table 1). Most of the other pathways had no significant expression differences. Interestingly, only the expressions of methane metabolism, oxidative phosphorylation and pyruvate metabolism were higher in LN and positively contributed to methane production (Fig. 4 and Table 1), but the other pathways had higher expressions in HN. This situation was similar with that of level 2. This further confirmed that high ammonia provided some improvements to substrate metabolisms mainly conducted by bacteria, but inhibited methanogenic activity. Consequently, although each step of AD food web played crucial roles in actual methane production, the ammonia toxicity on AD process mainly targeted methanogenic process to inhibit methane production. Although the expressions of individual key genes could generally explain the ammonia toxicity on AD process, gene co-expressions in response to ammonia probably provided a systemic sight. 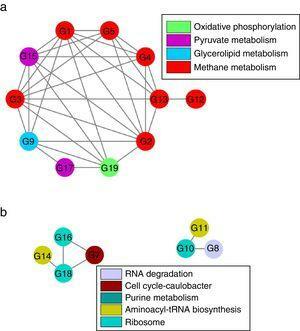 The inhibition of the co-expressions of the genes involved in methane metabolism, glycerolipid metabolism, pyruvate metabolism and oxidative phosphorylation indicated that these pathways probably performed a cooperation to regulate AD efficiency that was mainly represented by methane production. The coupling relationship between methane metabolism and oxidative phosphorylation has been revealed before.1 The glycerolipid metabolism and pyruvate metabolism probably provided potential substrates29 for methanogenesis. Interestingly, nearly all the genes which encode acetyl-CoA decarbonylase showed inhibition of co-expressions under the high ammonia condition, which further demonstrated that acetoclastic methanogenesis were inhibited by high ammonia. This also showed that these genes compared to other methanogenic genes were unitedly and highly sensitive to NH4+ concentration. These genes could be used as potential indicators for ammonia toxicity on AD process. Additionally, the in inhibition of co-expression of the genes which encode acetyl-CoA decarbonylase and methyl-coenzyme M reductase, indicating the cooperation of the two enzymes in methanogenesis. Consequently, except methanogenesis, most of pathways were not significantly influenced by high ammonia concentration, so that they were probably not the key factors contributing to decreased methane production. Thus, ammonia toxicity on AD process mainly targeted methanogenic process by inhibiting the expressions of genes which encode acetyl-CoA decarbonylase and methyl-coenzyme M reductase to finally decrease methane production. This study revealed mechanisms underlying microbial response to ammonia pressure based on gene expressions, and further discovered ammonia inhibition only targeting on the genes encoding the above two enzymes. However, the adaptions of microbial gene expressions to ammonia pressure during longtime AD also should be considered in the future work. This work was supported by the Key Project of Education Department of Sichuan Province (No. 17ZA0215) and Major Cultivation Project of Education Department of Sichuan Province (No. 17CZ0018).